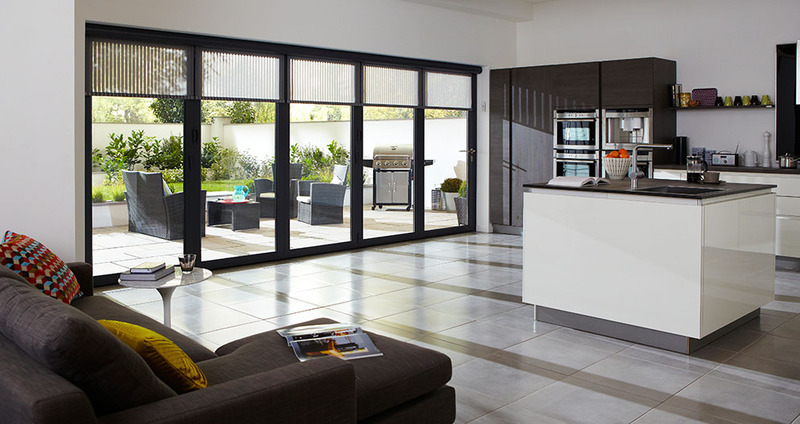 Constantly increasing in popularity, bi folding doors are fast becoming an essential part of a property. They completely transform a room as they change the feel of space and lighting, whilst adding monetary value to your home. They add a focal point of their own, with simplistic yet effective styles that complement existing room décor. Carefully crafted, bi folds adapt to their surroundings, designers consider every significant detail so they blend and adapt nicely with any space. Every product is a different one, making yours exclusive and unique to you. These bespoke structures can be specified depending on your exacting requirements whether it’s a traditional bi fold door, a number of fixed door frames or a modern ‘multifold,’ with a floating corner post you can design your doors with many different settings. Doors can be opened from left to right, at 90 degree angles, inwards or outwards. Architects and designers will be able to carefully evaluate your house and your usage before hand to maximise your space’s potential and their usability. Aluminium bi folds boast efficient weight and strength. Tried and tested, the material allows an easy-to-push door, giving you great access to your garden. Lightweight aluminium frames are perfect for maintaining their finish and being easy to clean. Although they’re a moveable feature, aluminium doors also offer a sturdiness and reassured level of protection from winds and rain. Another added bonus is the durable powder coating that most retailers provide, the coating comes in a wide range of colours, so that your doors can fit right in with the colour and look of your home – you can even give them a timber-like appearance if you’re looking for a more classic look. You may think that a wall of glass isn’t the safest option when it comes to burglars, but it’s actually a lot harder to break in, or through. All glazing with have a toughen finish, which makes them incredibly safe and strong. The door frames are safe structures too, they provide you with a multi-locking system and high security hinges, giving you that extra level of reassurance. If you’re interested in a bi folding door, take a look at our gallery of products, or come and visit our outstanding showroom.